Buying snorkel gear piece by piece can be quite time-consuming. Fortunately, there are plenty of good snorkel sets available. These include the mask, snorkel, and fins in one package. Since there are so many options out there, we decided to compile a list of the best snorkel gear. We also included a guide on how to find a quality set by yourself. 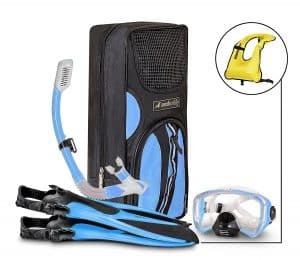 The SealBuddy FIJI snorkel set with travel Gear Bag & vest Included. For a collection to be deemed the best snorkeling gear set, each of the items need to be of equal quality. This means that the mask, snorkel, and fins must offer the same level of durability, comfort, and consistent performance. This is something to be careful with companies that are well-known for one aspect, but not the others. Always look at the construction of each of the gear to determine that they are all up to standard. The most important factor regarding a snorkeling mask is the fit. 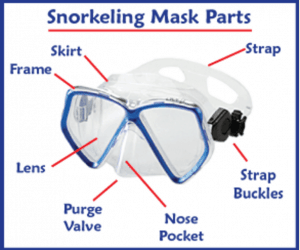 A well-fitting mask eliminates many of the problems typically experienced by snorkelers. This includes water entering the mask while swimming and fog forming on the lenses. The part of the mask that is responsible for creating a seal against your skin is the skirt. A skirt that is wider is better equipped to seal the mask to your face, thus lessening the chance of the water entering in. The skirt can be made either from silicone or plastic. Silicone tends to be more durable and works well with sensitive skin. Another aspect that comes into play is the fit of the mask. A snorkel mask that fits you well will not only prevent leaking, it will also make the mask more comfortable to wear as well. To ensure that the mask remains flush against your head, look for hardy straps that can be easily adjusted to your size. The mask lens is usually constructed from plastic or tempered glass. For greater strength, and safety, it is best to stick with masks that are made from tempered glass. The other thing that you will notice is the variety in the number of lenses with snorkel masks. There is the single lens, double lens, and even ones with three and four windows. What you choose should be based on what is most comfortable to you and offers the best viewing experience when you are underwater. As you can imagine a well-functioning snorkel is an important part of any good snorkel set. Fortunately, there are only a few steps to determine whether or not a snorkel is of high quality. The first thing to look at is how comfortable the mouthpiece is inside of your mouth. It should stay in without too much effort and you shouldn’t have to bite down too hard on the bite piece either. Mouthpieces that are made from silicone are usually the most comfortable. There are different types of snorkels. There is the traditional design, the semi-dry option, and the dry snorkel. The semi-dry and dry snorkel are built to keep as much water out of your mouth as possible. They consist of features on top of the snorkel that prevent water from entering into the tube. These work well for people snorkeling in rough waters. There is quite a bit of variety with snorkel fins. For instance, they can either be open foot or closed foot. Open foot fins have the advantage of being adjustable and they also allow you to wear a boot if you require the insulation. Closed foot fins have been found to be more effective and the fit is certainly more comfortable. In the end, however, it is largely what you are comfortable with. The fins can also be categorized by length. There are the traditional ‘long’ fins and the travel-sized, short ones. With the longer fins, you get greater speed and are able to maneuver and control your direction under water better. These is not something that is not as noticeable with the short fins. However, these are lighter and take up much less space in your luggage if you are traveling. 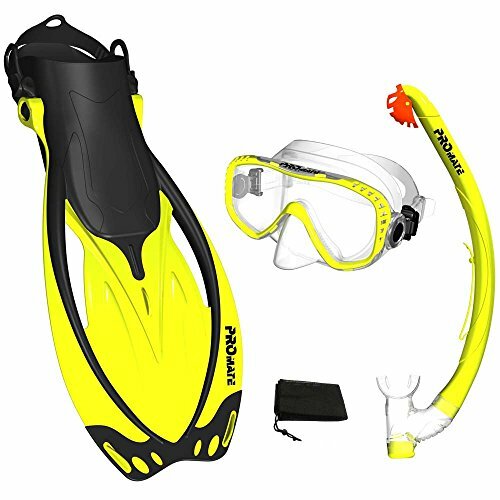 To ensure that you are buying the best snorkel gear set, you will first need to make certain that the above criteria are met. We define the best snorkel gear set as ones that are durable and have a design that is compatible for recreational and professional snorkeling. It also needs to fit a variety of individuals well, too. 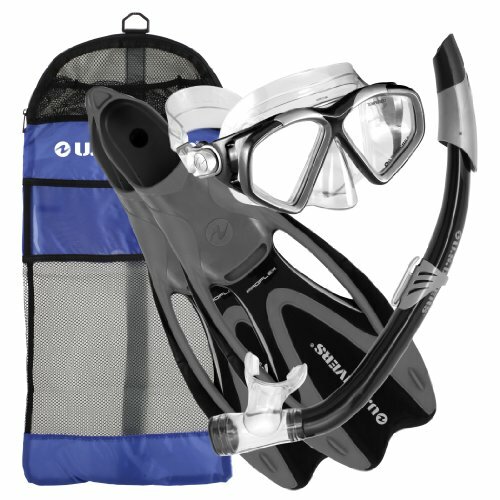 We decided that SealBuddy FIJI Panoramic snorkel set deserved to be crowned the best snorkeling gear set. We liked it because there were so many features, each of them of the highest quality. For starters, the mask is surrounded by a hypoallergenic mask that is excellent at sealing of the face. There are four lenses which make for a truly breathtaking experience underwater as you have a purview of 180° around you. The nose piece was also well-designed and helped to enhance the ear pressure balance. The snorkel, too, was on point. The mouthpiece was made from silicone and fit comfortably in our mouths, with only the slightest amount of tugging as we were swimming. Even better, it was a dry snorkel. This saved us the trouble of having to blow air through the snorkel to clear it. It is also fully submersible, which helps when you want to take a closer look underwater. The fins are of the short variety, which makes this an ideal travel set. To overcome the problems faced with these type of fins, SealBuddy has opted for dual composite streamlined blades. This reduces the amount of energy required when kicking. The open heel design ensures that many different swimmers will find a comfortable fit. The only downside with this set is that it is only available in large and extra-large sizes. 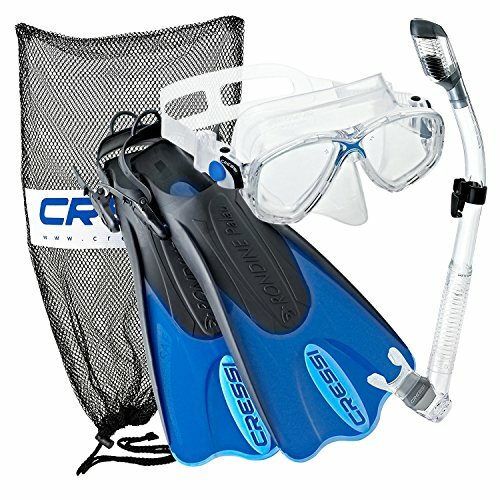 If you are looking for good snorkel gear, you can’t go wrong with the well-known Cressi brand. The company has managed to, once again, put out an excellent snorkel set with the Cressi Palau. The mask is a double lens one and has a transparent silicone skirt. The skirt fits well against all face shapes and sizes, creating a good seal against the skin. The straps around the mask are wide, creating a tight and comfortable fit at the back of the head. What is perhaps most notable about this set is the snorkel. It is a dry top snorkel, with anti-splash end. When water attempts to enter the snorkel, the valve closes automatically, preventing this. In the event that you do get water in your snorkel, it can easily be cleared with the purge valve at the bottom. The mouthpiece sports an ergonomic design and sits comfortably in the mouth. Interestingly enough, Cressi has made the entire snorkel out of transparent silicone. This way, it is less distracting and you can see the view around you much more clearly. The fins with this set offer a comfortable fit and the open heel design works well for all snorkelers. These are short fins and have a dual material blade. The fins range in size from extra small to extra large. What makes this U.S. Divers set good snorkel gear is that the company has seen it fit to mix and match some of their best equipment. You are treated to a Cozumel mask, Seabreeze II snorkel, and Proflex fins. With the Cozumel mask, there is a good chance of the mask fitting different faces. It comes equipped with an easy to adjust, 3-way buckles. The two window design makes the mask more compact. Now, the Seabreeze II snorkel isn’t a dry top snorkel. However, it does have a splash guard on the top. Therefore, when encountering waves, it is less likely that the water will enter the snorkel. This snorkel is not meant to be submerged, nonetheless. Fortunately, there is a one-way purge valve on it that allows you to clear the water out without breathing any of it in. The mouthpiece boasts an ergonomic design and is comfortable enough. Unlike the other fins on this list, the Proflex fins have closed heel pockets. The blades are dual composite and have a vented design. This, added to the fact that they are long fins, means that they produce excellent power and cut down on the amount of energy needed while swimming. The sizes for this set range from small to large. 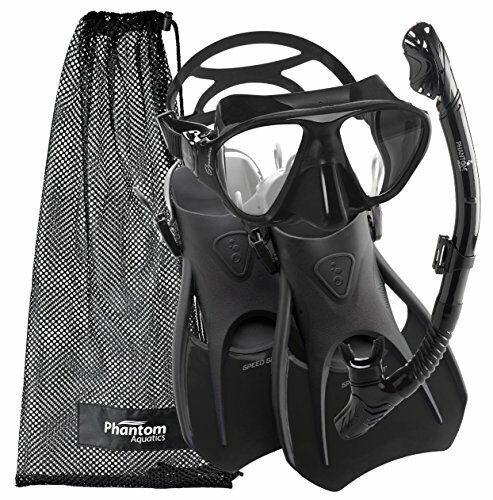 In this Phantom Aquatics Speed Sport set, while all the components are great, the mask is the real winner. The liquid silicone skirt offers up a comfortable yet tight fit around the face. This is further enhanced by its low internal volume features. This mask is built so well that it can even be used for freediving. The skirt around the mask is black which works well for snorkelers involved in underwater photography. The lenses are made from durable and safe, tempered glass. The snorkel is a semi-dry top one. Therefore, it will manage to keep most of the water out of the tube, you can still expect some splashing. This means that you can’t really dive with the snorkel still attached. The fins are small and travel-sized. They come with an open toe heel which allows for a more precise fit. These have sizes ranging from small to large. Although the fins are smaller, they don’t really slow you down much as they have been well designed. This is the best snorkel gear for beginners. 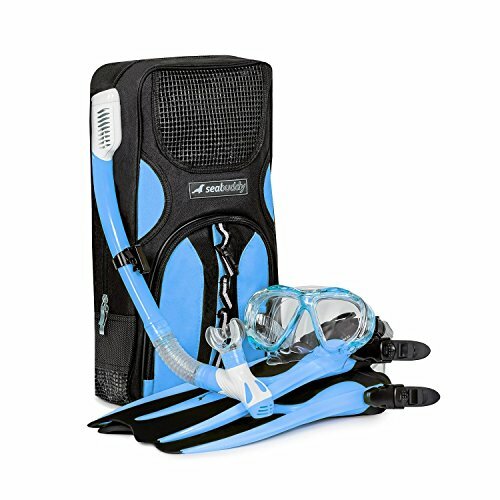 The Promate Snorkel set is a good option for novice snorkelers. The mask is a single lens one with a transparent silicone skirt which allows a tight seal around the eyes and nose. The adjustable buckles allow you to easily adjust the length of the straps to fit many different head shapes and sizes. One of the reasons that this would work well for beginner snorkelers is because of the dry top snorkel. Here, the top of the snorkel is designed in such a way that prevents most of the water from entering. Then, there are the fins which are the traditional, long ones. They are contoured and have a drag reducing jet vent design. This means that they have been made to lessen the effort required while swimming. As a result, you are propelled forward with greater force, but you don’t have to kick as hard. The only thing that we didn’t like about the fins were that the sizes were all grouped together. Therefore, you have to choose between S/M and M/L/XL. 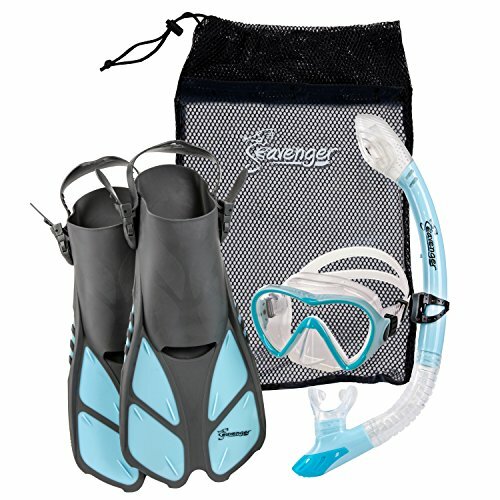 One of the best things about the Seavenger snorkel set is that is one of the most versatile sets on this list. This is because they offer a large range of sizes. The XXS size is even petite enough to fit children. This is something that could definitely serve the whole family well. This is not the only standout feature about the set, however. The mask is made from tempered glass, making it impact resistant as well as safe. Also, the larger lens makes it easier to get a better look at your underwater surroundings. Then, there is the snorkel. The snorkel is a dry top one with a splash guard. This means that there will be no water flowing into the airway either when you are floating on the surface or when you dive down deeper. The fins are short but have been built to add a bit more power to your kick when you swim. As a result, you can go faster and not feel as tired afterwards. These all can be considered truly outstanding snorkel sets. To get the best possible experience, you should decide on one from this list. If you decide to get a different one, make sure that it follows the requirements mentioned in the guide.